Music buffs would love this idea! Now you can strum sonic tunes on the guitar while you are mobile! A set of ultra compact guitars have been hatched by Bob Wiley, an American instrument designer. With a length of nineteen inches, and made out of a single piece of wood, these small sized guitars have a marvelous looking stretched out body. Dubbed as the ‘ministar’, these guitars have only a head and neck, sans the bulky central portion fitted in all conventional guitars. The thought behind creating the instrument are the musicians, who travel a lot and need to carry their favorite guitars along with them on trips. Also, while traveling, there is a risk of damaging the guitar. This can be avoided if the guitar itself is designed to be portable and can be stashed away in a bag for safekeeping. After conducting thorough research, Bob Wiley concluded that the tones emitted by the guitar have absolutely no link to the outer shape of its body. Although a subject of an everlasting debate, he stuck to his point of view and came out with the all-new ministar. The theory has also been proved by Les Paul’s Log, which did not have a sizable body like every other guitar. Different models of the guitar have been put together with each model suited to play tunes from various music genres. There is the jazzster, rokstar and folkstar; you also have electric guitars like the testar and the rock ‘caster’ for bass. Most guitars are about 31 inches long and the price falls in the range of $280 to $350. The bass ones are longer, about 41 inches, and cost more than $300. There is a fingerboard on one end, then the neck and the headstock, all made out of the same piece of wood. The guitars also slot in the scamp or ‘self-contained amp, which is a headphone amp powered by batteries. The scamp has a distortion circuit and EQ and contour boost on basses integrated with it. There are also pickup selectors located at the base and a volume knob which can be switched on and off. Despite its compact size and unique layout, the resonance produced by the instrument is full bodied. The design of the guitar is ergonomic, helping to play the instrument much better. The piece of wood is quite sturdy thus making a stronger base for vibration of the strings. Tuning components never clatter due to their thoughtful positioning at the cutaway center of the headstock. Guitarists can choose to attach a strap to the metal antennae on the body or play without the strap. Strumming away the guitar while sitting down is also very easy, just rest the hand on the wooden plate provided. Any musician or guitarist who travels a lot will simply love these. Also, guitar teachers, who need to get from one place to another, will surely appreciate their portability. College students and those pursuing their music interests alongside other mainstream activities will also love it – carry the guitar along with the everyday backpack while going to school or college, stop on the way to attend the guitar class, and then easily carry the instrument back home. The engineering of this musical contraption is mind blowing, and they are really easy to carry as the guitar can be dismembered to fit into a travel bag. Capable of being amplified, the device can be plugged directly into amplification equipment, for instance stereo headphones. In fact, they can be easily attached to different devices like Karaoke machines, sound systems, microphones and even computer speakers. A wide selection of models are available in this line such as the Little Thumper Nylon String Bass, SongBird Jazz Steel String, SongBird Hybrid, Classic Maple, etc. Known as the DeVillain folding guitar, this one looks just like any other ordinary guitar. But its specialty lies in its foldable design; the elongated stand can be flipped over and made to rest on its bigger ovular top half. Reducing to half in size, the guitar can now be easily stuffed inside a large bag and carried around. Thus, traveling with this guitar becomes real easy and the guitar is just perfect for air travel. A backpack is also available with purchase of the product. Its Centerfold Slim edition is the smallest range of guitars with a normal sized full scale neck. A touch screen to control plunks and clangs of the guitar is truly ingenious, and this marvelous idea has been put into operation in the all-new Misa Digital guitar. Not many musical instruments have a futuristic, complex and robotic design but this guitar surely goes all the way. There are absolutely no strings here, use the touch screen instead to pluck melodies, which might require one to get used to playing it. Looking quite like an electric guitar on the outside, the touch screen in the middle lights up when you tap fingers on it to play the music, different spots on the screen light up when touched and dim out just as fingers are lifted off the surface. It boasts of fitting in hi-tech mechanization, including MIDI controller, Linux operating system and Ethernet port. 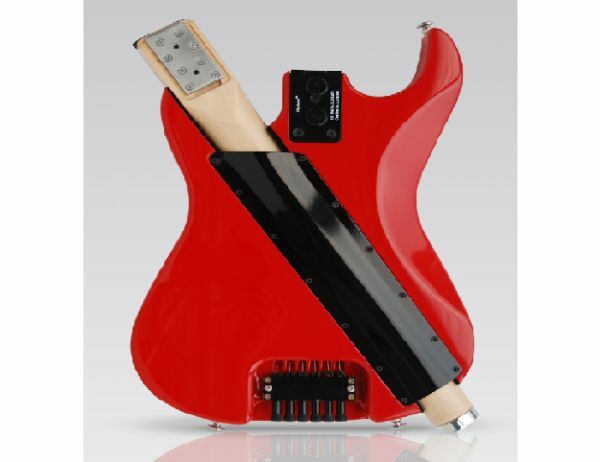 It has 24 frets on the neck, polyphonic synthesizer and fits in digital effects like distortion, modulation, etc. Another guitar which looks just like any other regular one, but this one too is easy to carry around. The unique clip joint system has been patented by its maker, Woody Stewart. The long stick-like base of the instrument can be detached from its big and bulky top half. Worry not, as the stick will not take up additional space in the luggage bag, there is space inside the bigger half to accommodate the base. The compactly packaged guitar now will easily fit inside a medium sized carry bag; this is surely a brilliant portable design. Taking apart and putting the guitar back together will only take a couple of minutes. The guitar has a very pleasing look due to its alder body, dark chrome finish and rosewood fingerboard. Plucking at this guitar is an enjoyable experience, the chimes and twangs come out silky smooth.